LMU researchers have developed a short peptide that inhibits the activation of a signal pathway in monocytes that enables monocytes to adhere stick to endothelial cells and penetrate sites of acute inflammation. 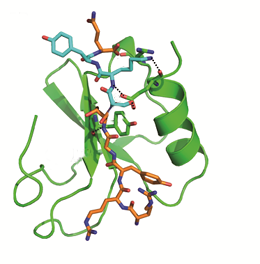 The image depicts the binding of the SKY peptide to CCL5 (green), which inhibits docking of HNP1 and thus prevents the formation of the HNP1-CCL5 heteromer. A class of white blood cells known as monocytes plays a crucial role in determining the course of immune responses. Unless tightly controlled, their actions can result in tissue damage that poses a substantial risk to health. Such a situation occurs when, in response to chemical signals, excessive numbers of monocytes infiltrate between the endothelial cells that line the blood vessels and induce a chronic inflammatory reaction in the underlying tissue. Researchers led by Professor Oliver Söhnlein of the Institute for Cardiovascular Prevention (IPEK) at LMU have now found a way to inhibit the local influx of monocytes from the circulation into the tissues. Their findings appear in the latest issue of the journal “Science Translational Medicine”. Monocyte infiltration into sites of inflammation is initiated by a cascade of reactions that allows the monocytes to stick to and to squeeze between neighboring endothelial cells. Recruitment of large numbers of monocytes to the vascular wall is often preceeded by the activation of two other cell types – neutrophils (the most abundant class of leukocytes in the blood) and platelets. In the new study, Söhnlein and his colleagues focused on the role of soluble mediators released from neutrophils and platelets in the adhesion and recruitment of monocytes. “Both neutrophils and platelets synthesize specific signal proteins, which are encapsulated in storage vesicles and are secreted when the cells bind to damaged tissues,” Söhnlein explains. Moreover, “heteromeric” complexes formed between proteins released from the two cell types stimulate monocytes to bind to the vessel wall. “These heteromers offer attractive targets for therapeutic intervention, as inhibition of their formation should prevent activation of the signaling pathway that allows monocytes to attach to the vessel wall,” Söhnlein points out. With this aim in mind, the researchers looked for heteromeric interactions between proteins secreted by neutrophils and platelets, and detected binding between HNP1 and CCL5. On the basis of a structural characterization of the two, the group identified the sites of interaction between them. They then synthesized a short sequence of amino acids, which they refer to as the SKY peptide, designed to block this interaction. “The SKY peptide is structurally very similar to a segment of HNP1, which is secreted by neutrophils,” Söhnlein explains, and because it mimics the part of HNP1 that binds to CCL5, which is itself secreted by platelets, the molecule should be capable of blocking the interaction site on the latter. Indeed, SKY peptide was shown to bind to CCL5, and to prevent the formation of HNP1-CCL5 heteromers. As a result, the monocytes are not activated, cannot bind to the endothelium, and continue on their way through the circulation. “The SKY peptide is a highly potent inhibitor of the interaction between CCL5 and HNP1,” says Söhnlein. Moreover, the peptide has no effect on the fundamental functions of the signal proteins themselves. All it does is prevent them from forming heteromers. “Normal immune responses are not perturbed by SKY peptide,” Söhnlein adds. In light of this promising functional profile, Söhnlein has applied for a patent on the SKY peptide.